New renderings reveal a slim, triangulated hotel tower for downtown L.A.
A new 58-story tower proposed by Los Angeles–based architects Nardi Associates has taken another step forward this week. The thin, diagrid-supported Olympic Tower will feature 373 hotel rooms, 374 condominium units, 33,498 square feet of offices, and more than 65,000 square feet of retail and commercial spaces, Urbanize.LA reports. The building is also slated to include an astounding 12 parking levels—with half of those levels located above ground in the building’s podium—despite being located between two busy transit stops. The above-ground parking areas are to be wrapped in residential units, however, so the podium’s presence on the street will at least include an element of liveliness. 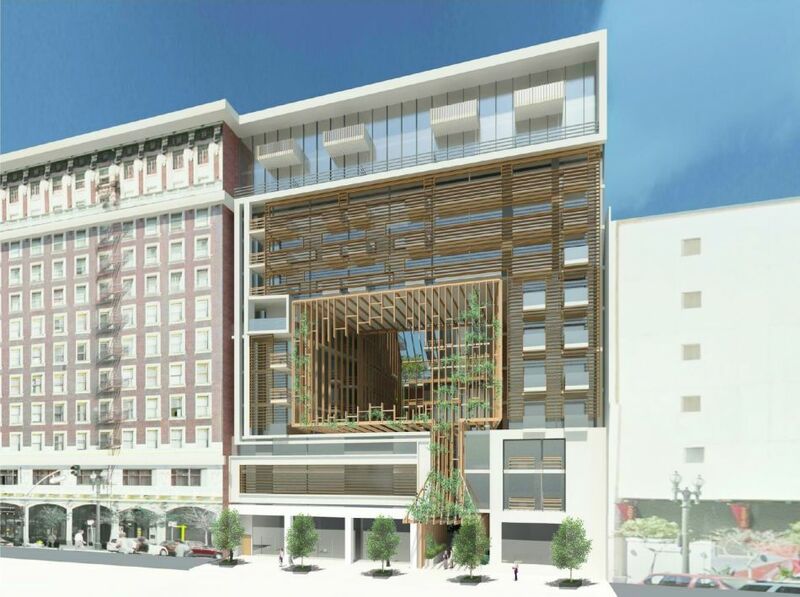 The project team has unveiled a bevy of new renderings for the development in conjunction with the publication of a draft environmental impact report. The renderings depict more detailed views of the tower’s amenities, which include several carved-out, multi-story loggia spaces and a collection of landscaped pool terraces. The new views also showcase LED signage along the tower’s lower levels, similar to those proposed and already built for many of the surrounding projects on the way to neighboring sites. The 742-foot tower will join a growing spine of high rise towers rising along Figueroa Street in Downtown Los Angeles, a new linear tower district capped on one end by the AC Martin-designed Wilshire Grand tower. Over 20 towers are planned for the area, which borders the L.A. Live, Staples Center, and Los Angeles Convention Center complexes. The new developments constitute part of the city’s effort to add badly needed hotel accommodations around the convention center, which has seen business suffer over the years due to the relative dearth of nearby lodging. A construction start date has not been announced for Olympic Tower, but the draft environmental report states that once construction begins it should take about 34 months to complete the project.